Tonight we’ll be debuting the first complete performance of the brand new album ‘A Jazz Odyssey’. 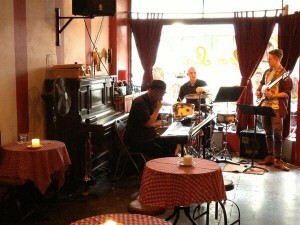 Live at the Paris Cat Jazz Club. Tomorrow night we’ll be tearing it up down at The Paris Cat Jazz. Get on down to hear a boatload of cracking new tunes! 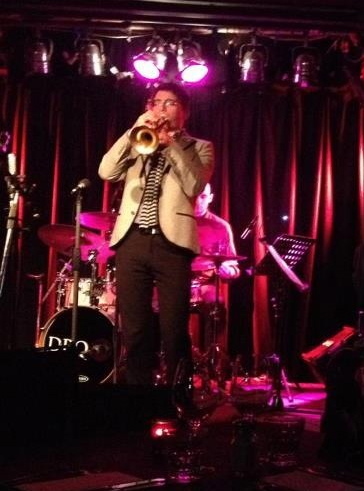 Friday night at The Paris Cat the DBQ will be presenting heaps of brand new charts. Visit pariscat.com.au to get your tickets! Tickets are selling fast to what looks like being a highlight gig for the DBQ this year. The band will perform the entire new (yet to be recorded) album in the first set and then blow apart some choice standards in the second set. Visit www.pariscat.com.au to get your tickets in advance for the DBQ’s show on Friday 19th April. General News Broke my humerus in 3 places today. Surgery 2moro…. Broke my humerus in 3 places today. Surgery 2moro. 1 handed trumpet playing here I come. Can’t be using ANY mouthpiece pressure now I guess. On Friday April 19th The NEW Daimon Brunton Quintet will perform in full the brand new album, ‘A Jazz Odyssey’ at The Paris Cat Jazz Club. The album is yet to be recorded but the band is soon to go into the studio to record the DBQ’s 5th offering. The album draws conceptually on Orchestral Chaconne’s, Mozart’s Operatic work and Terence Blanchard’s album ‘Flow’. As with all of Daimon’s compositions there is some genuinely brand new music. The band will start shortly after 9:00pm and DBQ gigs at The Paris Cat are generally fairly packed affairs so be sure to book your tickets early at www.pariscat.com.au.